Due to longstanding and elaborate liquor laws, it is not particularly easy to buy booze in Pennsylvania. But now the state's trying to make it a little bit easier—with ID-swiping, breathalyzer-sporting wine bottle vending machines. The machines are about the size of four large refrigerators, though the wines are kept at room temperature. An ATM-type device sits at one end. 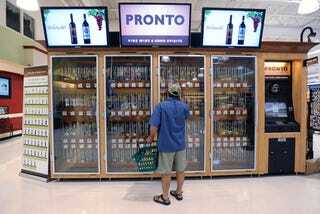 A customer chooses a wine on a touch-screen display, swipes an ID, blows into an alcohol sensor (no contact with the machine is required) and looks into a surveillance camera. A state employee in Harrisburg remotely approves the sale after verifying the buyer matches the photo ID.